Vehicle Charge Time: Indicates how long it takes to charge a fully discharged battery using Level 2, 240-volt electric vehicle supply equipment. Driving Range: Estimates the approximate number of miles that a vehicle can travel in combined city and highway driving before the battery must be recharged. Fuel Consumption Rate: Shows how many kilowatt-hours (kWh) of electricity an EV would use to travel 100 miles. Like gallons per 100 miles, the kWh per 100 miles relates directly to the amount of fuel used. It is an estimated rate of consumption rather than economy (measured in miles per gallon [MPG] or MPGe), which allows for more accurate energy usage comparisons between vehicles. What’s Tested: To test EV fuel economy, the vehicle battery is fully charged and the vehicle is parked overnight. The next day, the vehicle is tested over successive city cycles until the battery is depleted. The battery is then recharged and the energy consumption of the vehicle is determined by dividing the kWh of energy needed to recharge the battery by the miles traveled by the vehicle. MPGe is based on this figure. The process is repeated for highway driving cycles, and the combined city and highway fuel consumption and MPGe is based on the standard ratio of 55% city and 45% highway driving. What’s Reported: Like EVs, plug-in hybrid electric vehicle (PHEV) fuel economy labels include fuel cost savings, annual fuel cost, and emissions information. For PHEVs that can use either electricity or gasoline (but only one fuel at a time), also known as non-blended or series PHEVs, labels include information for the fuel economy of both fuel modes. The electricity information is identical to that of EVs, listing charge time, fuel economy in MPGe, and fuel consumption rate in kWh per 100 miles. The gasoline information provides fuel economy in MPG and fuel consumption information in gallons per 100 miles. 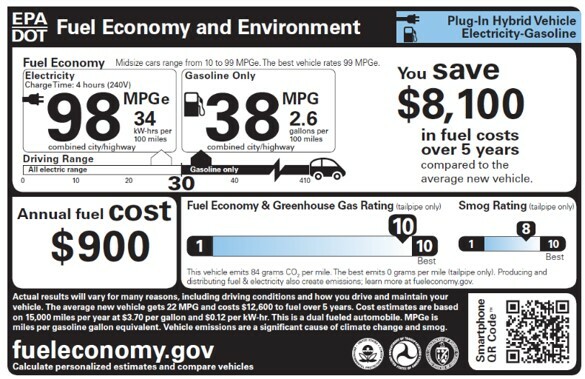 PHEV fuel economy labels also include electricity only, gasoline only, and combined electricity and gasoline driving range estimates. For PHEVs that use electricity and gasoline at the same time, also known as blended or parallel PHEVs, fuel economy labels reflect the fuel economy, fuel consumption, and range of the vehicle when it uses its standard electricity and gasoline mix. What’s Tested: Because series PHEVs can use either electricity or gasoline, the EPA determines a vehicle’s fuel economy and fuel consumption based both on its use of only electricity and only gasoline. To determine a PHEV’s electric fuel economy, the EPA issues testing methodology nearly identical to that of EVs. If the gasoline engine is required to complete the test cycle, the EPA methodology uses both the electric energy consumption and the gasoline consumption to calculate the MPGe values for the electric operation only. Vehicle testing for the gasoline operation of the vehicle is similar to any other conventional hybrid electric vehicle. Parallel PHEVs are tested using their standard mix of electricity and gasoline. What’s Reported: The EPA also requires fuel economy information for original equipment manufacturer (OEM) vehicles that use alternative fuels. This includes dedicated natural gas, propane, and hydrogen vehicles, as well as bi-fuel vehicles, such as bi-fuel natural gas, propane, and flexible fuel vehicles (vehicles that may use 51%-83% ethanol-gasoline blends). Note that the EPA does not require fuel economy testing of vehicles converted to run alternative fuels after they are purchased. While the EPA does not list fuel economy information for vehicles that use biodiesel, all diesel vehicles may use fuel blends of up to 5% biodiesel. These vehicles achieve fuel economy very similar to conventional diesel. For vehicles that use exclusively alternative fuels (e.g., natural gas or hydrogen), the EPA lists fuel economy in MPGe in order to accurately reflect the fuel’s energy content and make easy comparisons with conventional fuel vehicles. Vehicles that can use either alternative fuels or conventional fuel, such as bi-fuel natural gas, bi-fuel propane, and flexible fuel vehicles, have fuel economy, fuel consumption, and range estimates for both the alternative and conventional fuel listed on their fuel economy labels. Fuel economy for alternative fuel use in bi-fuel and flexible fuel vehicles is listed in MPGe, while fuel economy for conventional fuel use is listed in MPG. What’s Tested: For vehicles that run exclusively on alternative fuels, fuel economy testing methods are similar to those of conventional vehicles. For bi-fuel and flexible fuel vehicles, the vehicle fuel economy is tested as it runs exclusively on each fuel, similar to PHEVs. For more information about AFV fuel economy, see the FuelEconomy.gov website (http://www.fueleconomy.gov/) and select from the Advanced Cars & Fuels menu. Also, view the Fuel Economy Toolkit (http://www.fueleconomy.gov/feg/toolkit.shtml).